Edfu temple is the most impressive one among all Nile temples between Luxor and Aswan. It is located in Edfu, which is located 60 km north of Aswan on the west bank of the Nile River in Upper Egypt. It’s will be amazing to visit this temple during your Nile cruise. It was established during the Ptolemaic Kingdom between 237 and 57 BC. Edfu temple was the center of the cult of a triad of gods. Edfu city was known in the Greek documents as, “Apollopolis Magna”. The reason behind this was that Horus was identified by the Greeks with their god Apollo. Edfu flourished a lot in the ancient era and the most important touristic landmark in it is Edfu Temple. It dates back to the Ptolemaic period. The construction work of the temple began about 237 B.C during the reign of Ptolemy III and it was finished during the reign of Ptolemy IV in 57 B.C. The temple’s construction and its additions took about 180 years. It consists of the Mamisi, which is the house of divine birth and it consists of an entrance, a chapel, and a court. Its walls are decorated and they show the divine birth of Horus. It consisted of a pillared hall, two transverse halls, and a barque sanctuary surrounded by chapels. Many of the temple’s carved reliefs were razed by followers of the Christian faith, which came to dominate Egypt. Throughout the centuries, the temple has been buried under the desert sands to the depth of 12 meters. The temple pylons were identified by the French expeditions in 1798. The French Egyptologist Auguste Mariette began to free the temple from the sands in 1860. 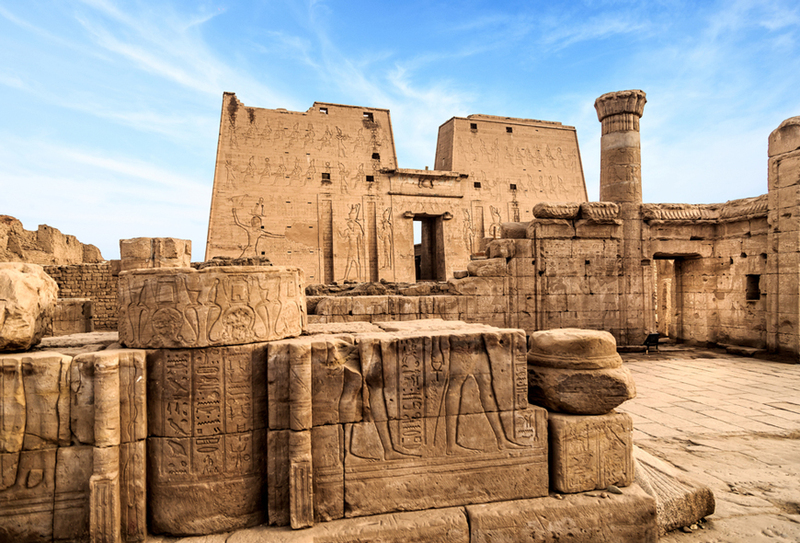 Edfu temple is a great example for the Egyptian temples because of its archeological significance. It has one of the amazing pylons among all of the Egyptian temples, which is 37m high and decorated with battle scenes, representing King Ptolemy VIII smiting his enemies before the god Horus. There is also an open courtyard that contains columns with floral capitals. It is also known as the court of offerings. There is a hypostyle hall that contains 12 columns to support the roof. At the end of this magnificent temple, there is the sanctuary that includes a niche where there is a statue of the god. This sanctuary is surrounded by 12 rooms. There are many religious scenes on the walls of the sanctuary. Some rooms were dedicated to religious purposes. There is a Nilometer, which is considered to be the most important element of the temple as it was used to measure the water level of the Nile and a chapel, which was dedicated to goddess Nut, there are many battle sceneries over the temple walls, which gives the temple its touristic importance. The wall that is located in the northern part of the court shows the marriage of Horus and Hathor, which is celebrated twice yearly, once in Edfu temple and the other is in Dendera temple, it includes a pylon that was built by Cleopatra’s father in the first century BC. It leads into a peristyle court and then a hypostyle hall that precedes the sanctuary of Horus. The temple was built in three main phases the First Phase includes the original building, which is considered to be the nucleus of the temple. When the country was stable in the fifth year of Ptolemy VII’s reign, the doors of the temple have been installed. The Second Phase includes the decoration of the temple and among them the inscriptions. The Third Phase includes the construction of the columns hall. The Pylon: Consists of two towers and each one of them has some rectangular niches. There are two statues represent the god Horus in front of the two towers. The Great Gate: is the main entrance of the temple that was made of cedar wood. The Large Courtyard: has two rows of columns on each side. Its length is 46 meters and its width is 42 meters. The Hall of the great columns: consists of 18 columns, which are arranged in rows and each row consists of 3 columns. The Hall of the small columns: is a small area that consists of 12 columns and has magnificent carvings and decorations. The First waiting room: was dedicated for presenting offerings to the gods. The Second waiting room: was dedicated to worship the gods. The Holy of Holies: was only entered by the king and the priest and is considered to be the most sacred place in Edfu Temple that is surrounded by 10 rooms. Egypt is full by history, culture, archaeological sites, charming beaches, and more, so if you prefer to visit the land of pharaohs and discover the hidden secrets in these breathtaking temples and tombs, then check our Egypt tour packages and choose you suitable trip.